I'm a marketing genius. Seriously, Febreze, call me. A while back I agreed to review some products for Febreze's new 'Destinations' line. And they sent me, literally, a duffel bag full of Febreze goodies. I thought, hm. I wonder if they're trying to tell me something. - A local resident's home, after a bout of stomach flu, was cleared out thanks to the Febreze Candle in Brazilian Carnaval. - The stench of a local employer's washroom (for the male employees) was subdued by the Febreze Air Effects in Moroccan Bazaar. - The stinkiest diaper pail on the block suddenly found itself next to a Febreze NOTICEables plug-in that was dispensing Hawaiian Aloha. The process of adding or subtracting poopy diapers to said pail is now much more pleasant. 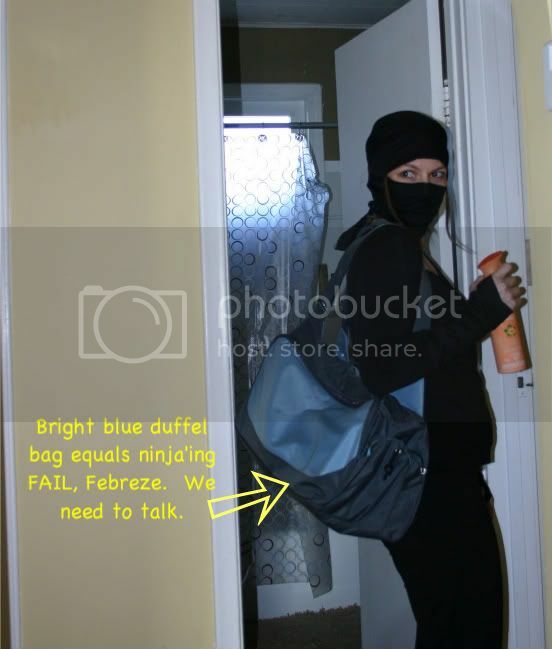 - The Febreze Ninja also launched on offensive on the public washroom at the local park, using Air Effects in both Brazilian Carnaval and Hawaiian Aloha. While the scents work well together, the Ninja admitted defeat, and left an uncharacteristic note stating that if she was expected to take on the smell of corpses and crackhead urine, she was going to need a bigger duffel bag. Where will the Febreze Ninja strike next? Only time - and smell - will tell!